In 2017, 90% of households in Great Britain had internet access, an increase from 89% in 2016 and 57% in 2006. We are beginning to rely on using the internet for our daily tasks – banking, music, communication etc. So why not finding support for mental health issues? You will see that they are various apps providing support – Headspace, Calm etc. This also extends to providing counselling online. Will it affect the relationship? 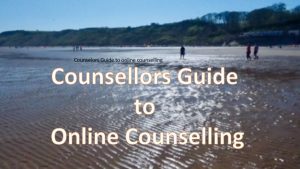 This counsellors guide will look at benefits of online counselling can offer you as a counsellor, look more in-depth how it can be delivered, as well as the pitfalls. Easy to access– Online counselling can be carried out using phone, ipads or laptops. Online counselling can be used on any of these devices. It can be set up quickly and can be carried out in your own home. Simple to set up– You need an email address and an user name. The online platforms are readily available and easy to download. Cost saving– there is no extra cost. Online counselling does not involve transport or travel time. Fits around you.No room bookings. You need to find a quiet room. You can offer it different times during the day or evening which is a huge benefit for many of my overseas aid workers who are often in different time zones than me. Grows your reputation– Majority of my online clients are aid workers and those involved in road accidents. Clients from all over UK come to me as they know I specialise in these areas. It is convenient for them as they do not have to consider where I am. What is important to them is the area of specialism that they want. Can be used anywhere– Mobile phones and laptops are transportable. You can therefore offer online counselling at home or at your counselling practice. The only consideration is the access you have to the internet. There are two choices of online counselling – Synchronous or Asynchronous. Funny complicated names, aren’t they? So what do they mean? Synchronous is when you (the counsellor) and the client are connected at the same time. It is similar to face to face counselling but you are talking via an online platform. You are both in ‘real time’ but in different locations. Synchronous counselling is conducted via platforms, such as Skype and Zoom or instant messenger. Skype is the most common platform to use for Synchronous counselling. However, due to Skpye not being HIPPA reliant, different platforms, such as Zoom and Visee are being offered. They are all free platforms which are easy to install and use. Most laptops and desktops come with microphones and webcams and are sufficient for online counselling. However, some people choose to buy these additionally. This is the most popular form of online counselling. It provides all the advantages as mentioned in the benefits above. Equipment failure. You must check your equipment. Microphone, sound and video issues are the common problems. Loss of internet. You need to ensure you have a good bandwidth. However, your client may not. You may be disconnected form. Client may not be familiar with the technology and it can cause a hindrance to the relationship. You cannot always pick up on body language. Distance can seem far when the client is distraught. You can be disturbed. You need to ensure you are in a quiet place and that you cannot be disturbed with other people trying to initiate a call or come into your room. Instant messaging chat via Skype is not encrypted. Email counselling (asynchronous) is not as familiar to clients or provided by many counsellors. It is when clients write down all their story about what is troubling them and put it in an email. The counsellors responds in a therapeutic way. To ensure email counselling stays confidential, BACP recommend you use an encrypted email service, such as hushmail and Protonmail. You need to allow yourself time to reply and this needs to be arranged with your client before. I give the client five days to write to me, and will respond within 48 hours. I restrict each email that the client sends to 500 words. As I type, I allow 50 minutes response time. The main benefits of email counselling is allows time for reflection (for both you and the client). All the clients thoughts and feelings can be written down which they can often find difficult to express when talking. Gives anonymity. This appeals to clients. It allows them to stay hidden. You can link to websites, apps or your own blog to help the client refer to additional self-help. Clients can write the email and before they send it, they can add to it when they like. Typing can be slow. Writing between 500 and 800 words can take time. I have found being able to type allows me not only write more words but also means I can concentrate on what I am writing, rather than worry about where the letters on the keyboard are. You are reliant on words alone. The therapeutic relationship cannot be built on body language, tone or using silence. If people struggle with reading or writing, it can seem intimidating or will not work for them. So you’ve decided that online counselling can be part of your counselling practice. Below are quick step to get started. How counsellors can get started with online counselling. Decide what platforms you are going to use – Skype, Zoom etc. How will clients pay you? Ensure you receive payment in advance. Design a contract. You need a contract with your client. This can be very similar to your contract you have with your face to face clients. You need to include a section which asks the client what they will bring to the sessions. This ensures you are able to offer the counselling for the client, as well as check for risk. I will not see any clients who present with risk. I will also not see any clients who live in The states. This is ensures I do not need to worry about different American state laws but also my insurance does not cover American clients. Think of risk. Have information of different resources and organisation you can refer client onto who are not suitable for online counselling. Find a quiet space. You must ensure you have no disturbances when you are seeing clients. Use a device that only you can access. Do not leave an open laptop as you do not want anyone else reading emails. This is more important with the new GDPR coming in force in May 2018. Regularly check your device for any technical errors. This entry was posted in counselling, email counselling, Online counselling, reflection and tagged asynchronous, counsellors guide, email counselling, HIPPA, online counselling, Skype, synchronous, zoom on May 13, 2018 by Hazel Hill.